Last Wednesday, I took a field trip to the North Anatolian Fault in Turkey, but I got distracted by this fine looking display of sedimentary structures in a dried-up mud puddle in an old quarry. Here’s a slightly more oblique perspective, to give a sense of how the individual mud flakes are internally laminated, and curl along the edges, producing a concave-up shape. If anyone wants a full-sized copy of any of these images for teaching purposes, let me know via e-mail, and I’ll send you one. There was even some structure to observe! What’s going on with these folds? 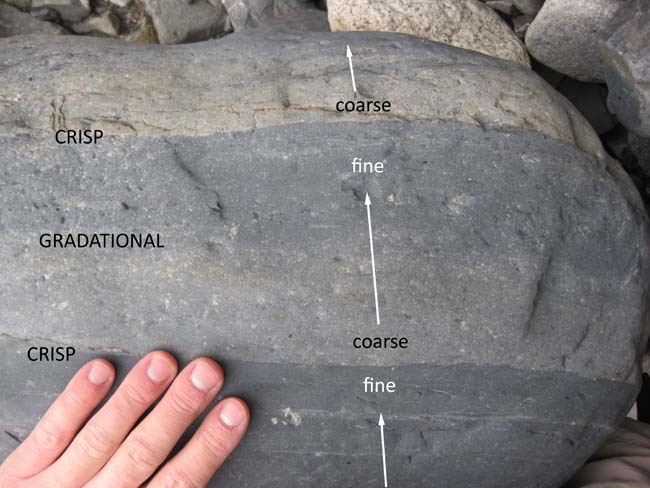 After all, the Allegheny Plateau isn’t known for pervasive structural shenanigans… I’m guessing this might be soft-sediment deformation: slumping and sliding of sedimentary layers before they got lithified… Any other thoughts? (chime in via the comments section below, if so). In the warmth of the new day, we hiked out, got apple dumplings at the Front Porch Restaurant across from Seneca Rocks, and drove back home along good old (new) Route 55. 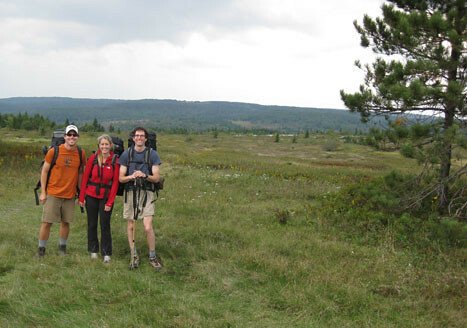 It was a great weekend away, just the right distance, in wild country, with great weather. I felt rejuvenated by the experience. 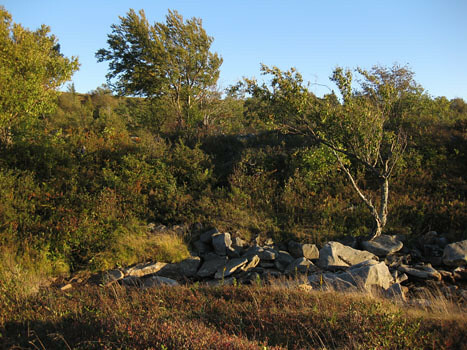 Over the summer, when my blogging access was limited to my iPhone, I uploaded a photo (taken with the iPhone) of a metamorphosed graded bed on the summit of Mount Washington, New Hampshire. Both of these images are enlargeable by clicking through (twice). I think today’s photos are of better quality than the iPhone photo. This is the coolest freakin’ thing ever. What you have here are alternating beds of quartzite and andalusite schist. 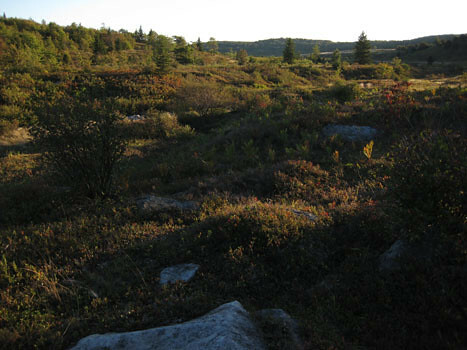 The boundaries between the two rock units are alternately crisp and gradational. Interpretation? 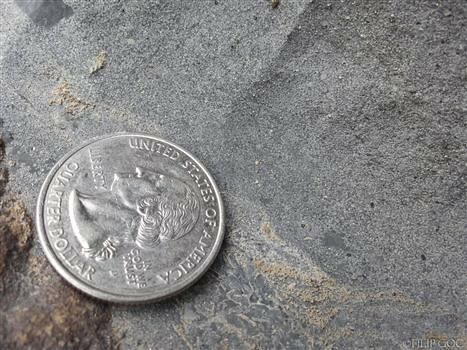 Once upon a time, you had a turbidite sequence where the bigger, heavier grains (quartz sand) settled out first, followed by progressively finer and finer mud. 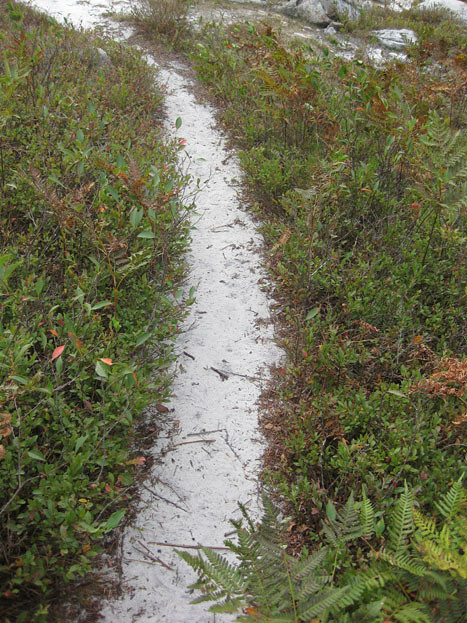 The base of the graded bed is a crisp transition from mud to sand, but then as you go up through the graded bed, it grades from sand into mud. 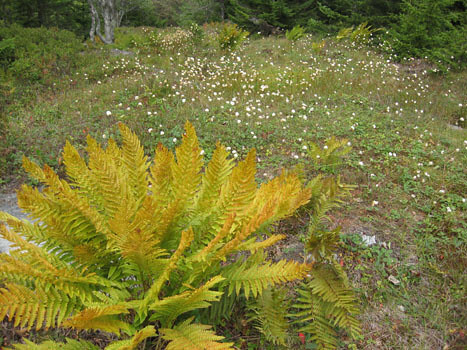 Later, these distinctive primary structures were metamorphosed during the late Devonian-aged east coast mountain building episode called the Acadian Orogeny. 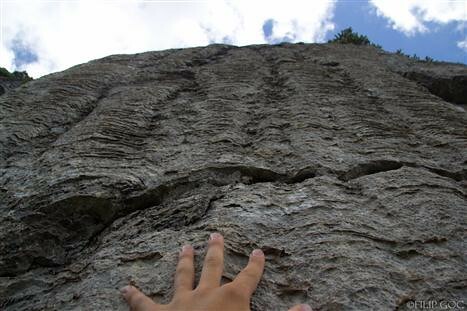 The high temperatures and pressures cooked the rock. 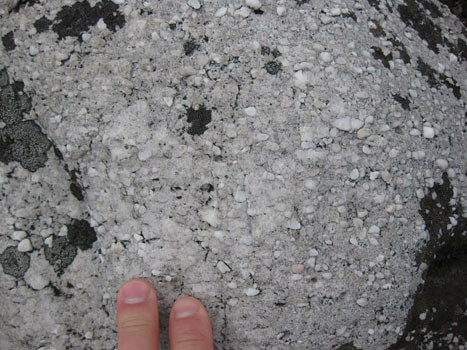 The sandy part, dominated by quartz, didn’t really change mineralogy much under the metamorphic conditions. 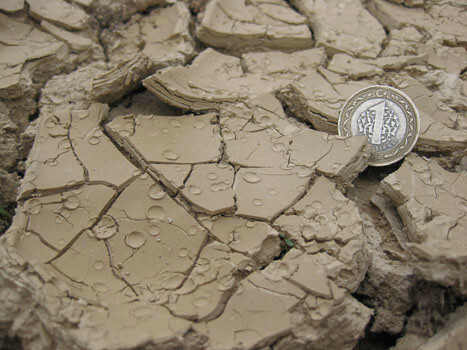 The muddy part, on the other hand, was chock full of clay minerals which are not in equilibrium under elevated temperatures and pressures, so they reacted chemically. Their elements reorganized into new minerals: big honkin’ crystals of the mineral andalusite. 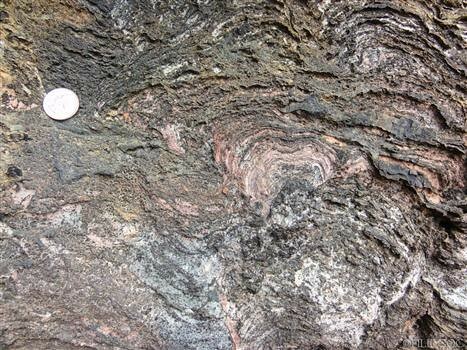 They might just as well have reorganized into sillimanite or kyanite if conditions were slightly different, but temperature dominated over pressure, so andalusite was the mineral form that was stable (at equilibrium) under those conditions. 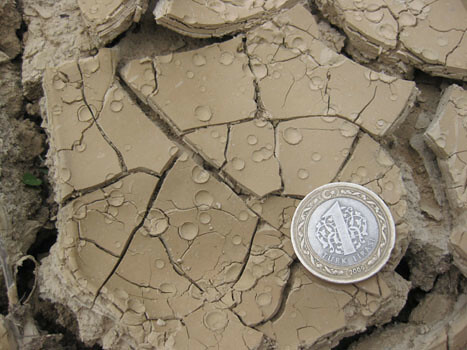 As a result, the “mud” was now coarser grained than the “sand.” The overall sense of grading had been flipped by the metamorphosis, yet the overall crisp/gradual pattern was preserved. This, my friends, is exquisite. 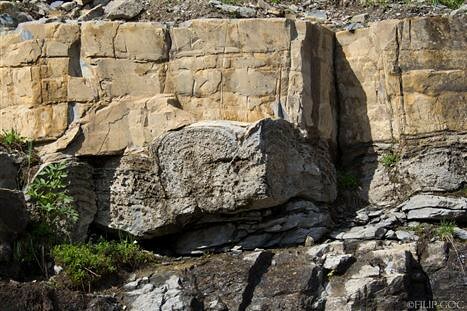 The geology around Glacier National Park is great for beginners because the area is structurally straightforward and formations are generally easy to distinguish. Still, there is a lot to be excited about. 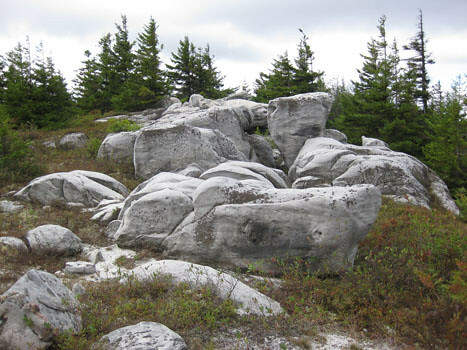 The rocks exposed firstly from the top down are old sedimentary rocks of the Belt Supergroup. It is called “Belt” after Belt, Montana, and “supergroup” because it is immense. 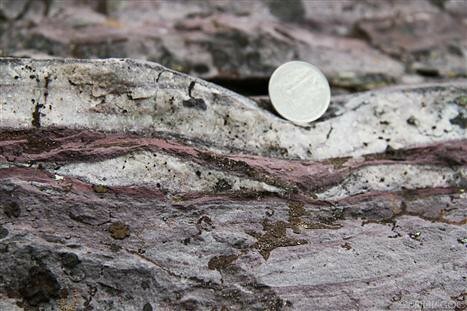 These rocks were deposited in a Mesoproteozoic (1.6-1.2 Ga) sea basin, and show little to no metamorphism despite their age. Below belt rocks that make up the peaks of Glacier NP, there lay Cretaceous (~100Ma) shales; which brings us to the structure. 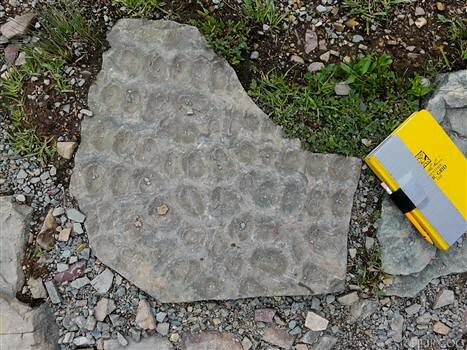 How can these young shales get underneath MUCH older Belt rocks? Yes, there is a major thrust fault, and it is called Lewis Overthrust. 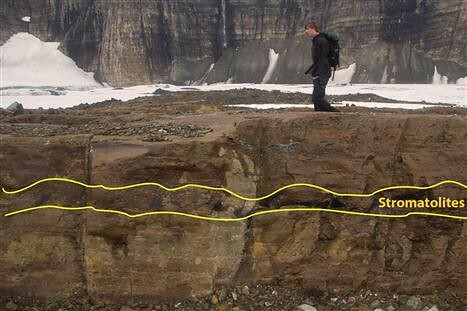 Simply put, the Belt rocks were first deposited in the sea basin. 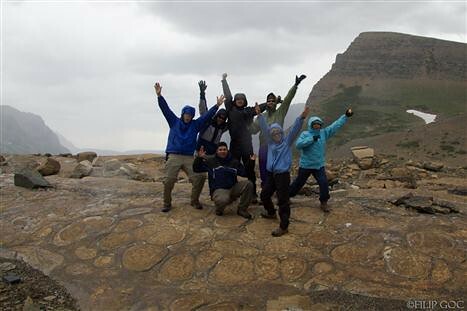 Then, Paleozoic rocks were deposited, but they are not exposed in Glacier NP, as they have eroded away. Then, Mesozoic rocks, including the Cretaceous shales and sandstones of the Western Interior Seaway, were deposited. 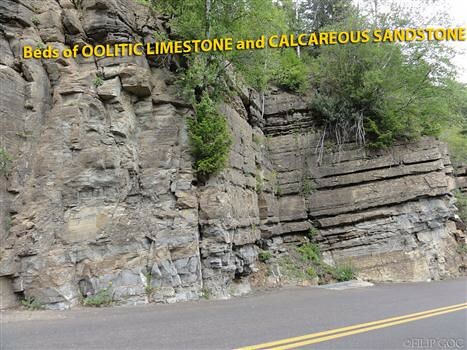 Around 150-80Ma, as a result of the Sevier Orogeny, a HUGE slab of Belt rocks hundreds of miles wide and 15-18 miles thick slid over the Cretaceous formations more than 50 miles east! 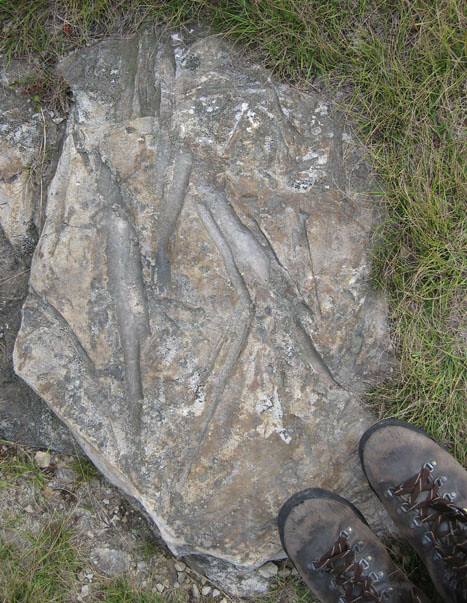 Slabs just love to glide on shales with their weak planes. Mr. Maitland from our group would call it the Banana Peel Principle, although most geologists who love French as much as I do prefer a much more refined term décollement horizon (yes, it is essentially a banana peel). Check it out in this photo. The Belt rocks of the Altyn and Appekunny formations comprise the cliffs. 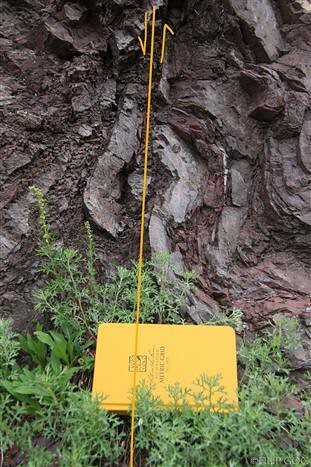 They are much more resistant to erosion than the weak Cretaceous strata underneath them (low hills covered in trees). 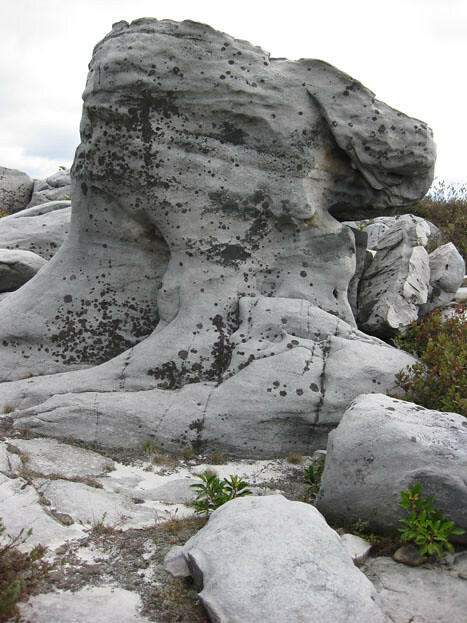 The striking white layer in the Appekunny formation is a quartzite bed. Then erosion took the stage with its rivers and mass wasting. Finally, around 2 Ma the Ice Age came, and we derive the name of the park from the enormous glaciers that carved the peaks into their current shapes. 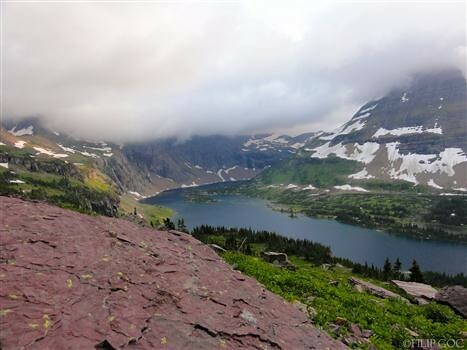 The last of these huge glaciers melted ~12,000 years ago, and some people think the park should therefore be named Glaciated Park, ExGlacier Park, or just Glacier-No-More. The glaciers to be seen there today are young and tiny. Glacier National Park is a great place to educate kids about geology because many formations can be identified by their colors. From old to young, there are Altyn (and Prichard), Appekunny, Grinnell, Empire, Helena (or Siyeh), Snowslip, and Shepard formations. Let’s get color-wise. 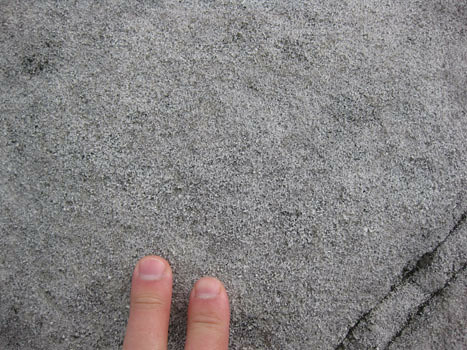 First above the Lewis Overthrust are the light gray to white (or weathered into light tan) layers of limestone and dolostone of the Altyn formation. 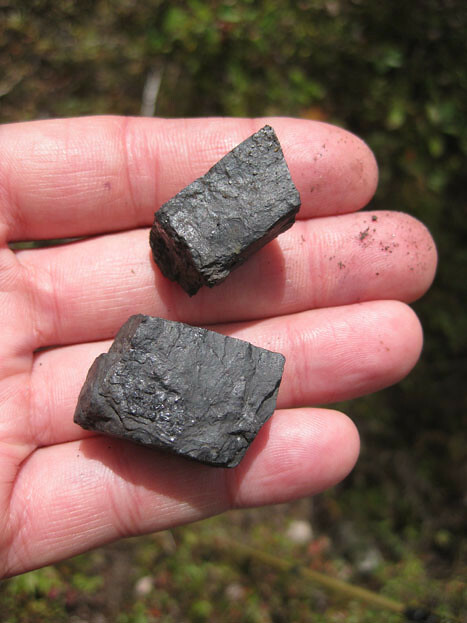 The Prichard formation exposed on the west side of the park is essentially of the same age as Altyn, but was deposited deeper, and is therefore darker as there wasn’t as much of oxygen in the depositional waters. It consists of dark gray to black argillite with slate-like appearance. 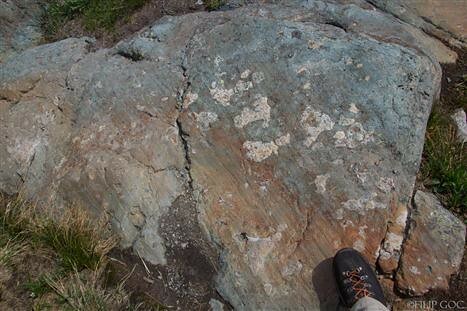 (Argillite is slightly metamorphosed mudstone.) Then there is light green or burgundy argillite of Appekunny formation. Both versions have the same iron content, but the purple version is more oxidized. 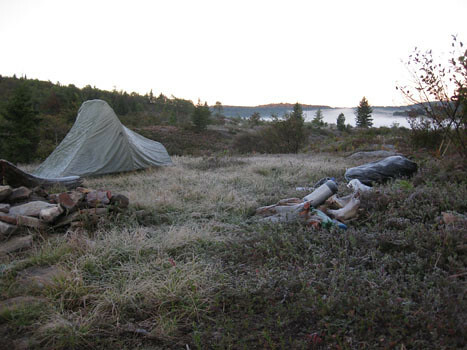 It was deposited closer to shore than Altyn. 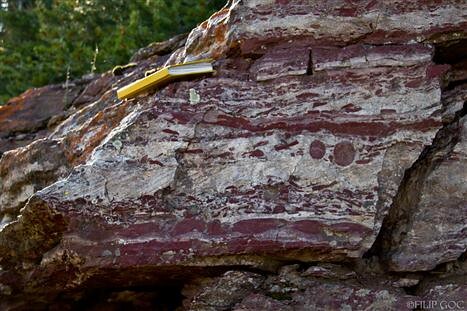 The Grinnell formation is the one dominated by burgundy argillite. 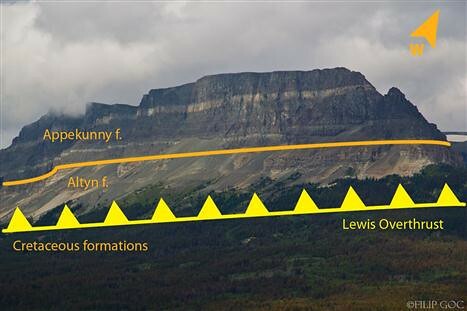 The Empire formation is a transitional formation between Grinnell and Helena. 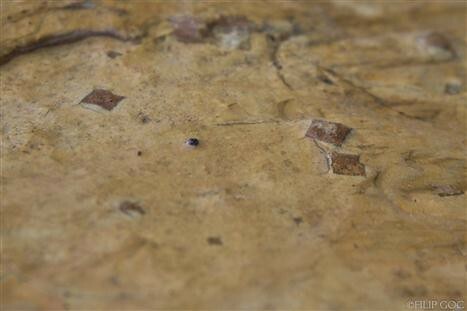 Helena consists of medium to dark gray dolostone and limestone, often covered with honey-colored weathering rind. 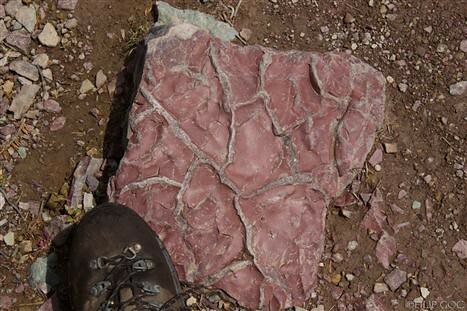 The Snowslip formation features red or green argillites, shades of orange or yellow, rusty colors, purple tones, white quartzite… pretty much “rainbow rock.” The Shepard formation is similar to Helena, gray limy rocks with orange buff. 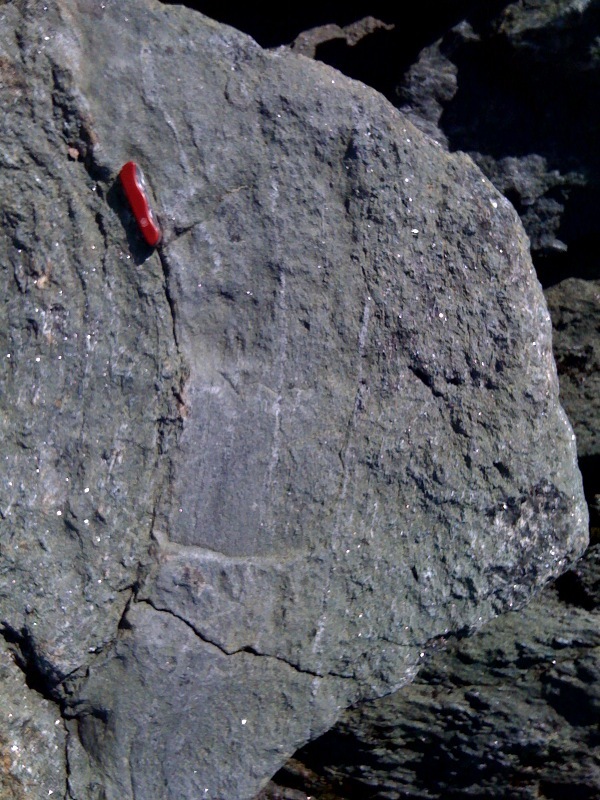 The Prichard formation is exposed on the west side of the park; is essentially of the same age as Altyn, but was deposited deeper, and is therefore darker as the increased pressure produced biotite. It consists of dark grey to black argillite with slate-like appearance. 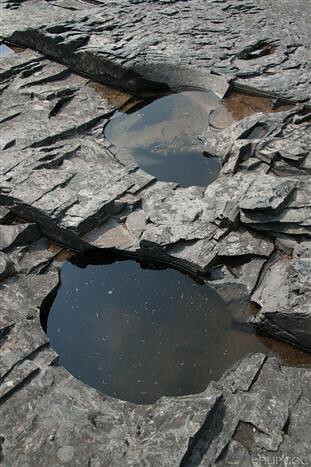 Aren’t these potholes beautiful? Also notice the joint sets. The diameter of the larger pothole is ~55cm. There are great features to be seen in the Grinnell formation. 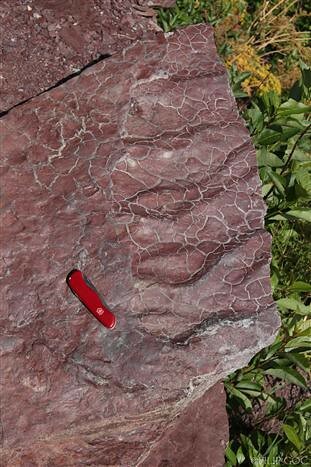 In this picture from McDonald Creek, there is cross-bedding in white quartzite, and a cross-section of ripple marks! 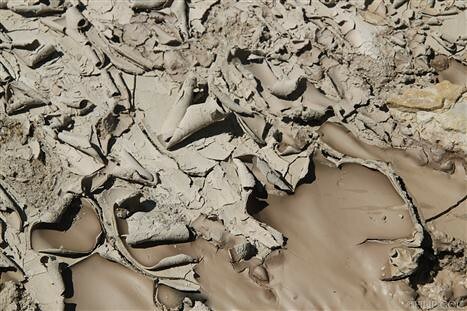 A stream dumped sand onto muddy shore, ripples were created, and then mud leveled them out! Quarter for scale. Streams or waves can easily carry those “chips” away, and deposit them with sand. That’s the mudchip rip-up clasts. 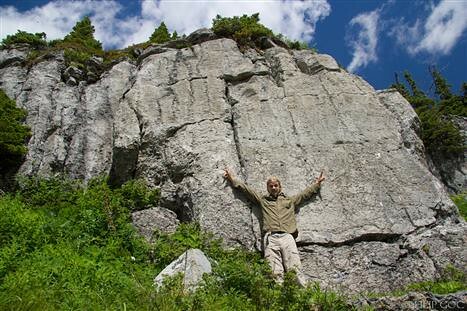 Very cool outcrop! 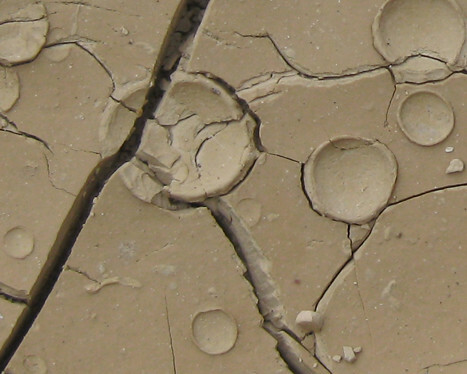 These are just another batch of nice mud cracks in Grinnell formation. Boot for scale. This boulder has mud cracks overprinting ripple marks. Two in one! Swiss Army knife (11 cm long) for scale. This one has it all. 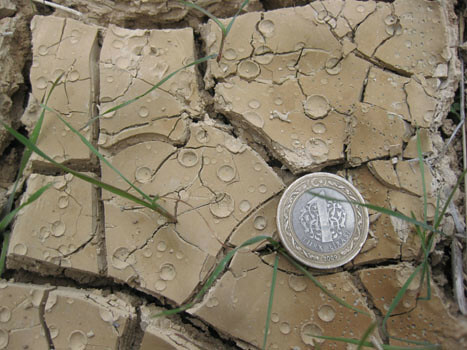 Cross bedding, mud chip clasts, ripples, and mudballs. Field notebook for scale. These strange ripples in the Shepard formation are called interference ripple marks. They form when two currents go against each other at ~90°. Field notebook for scale. Folded argillite and quartzite of the Grinnell formation with preserved ripple marks. Car keys for scale. A bit more of the structure within the Grinnell Formation. 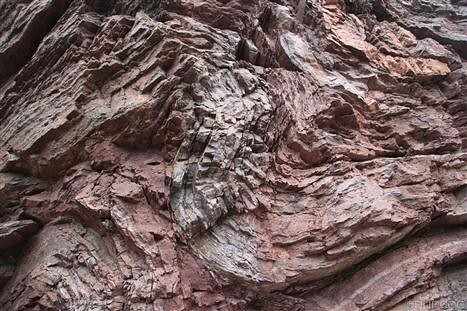 This beautiful faulted fold lies on the way to Grinnell Glacier. Field notebook for scale. 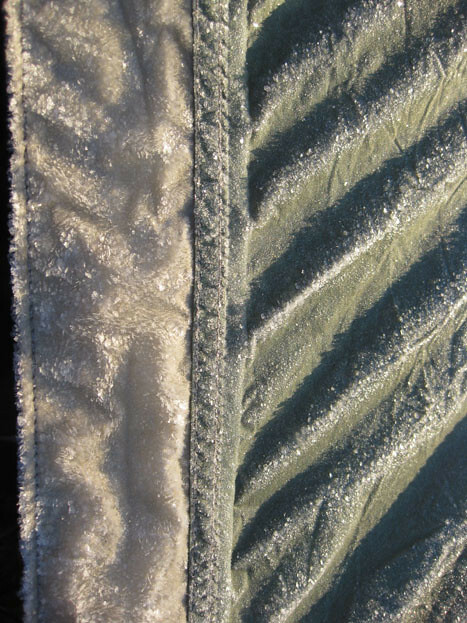 Here’s a fold that hasn’t yet been breached by a through-going fault. Width of field of view is about 30 cm. 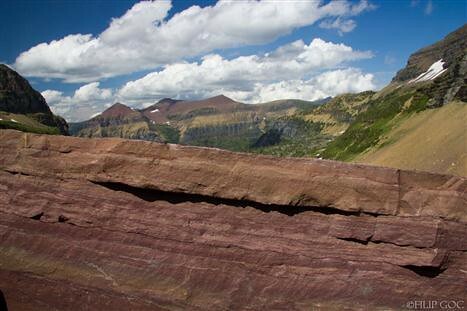 Note on prominent RED color in Glacier National Park: These red beds above St. Mary Lake are Grinnell formation. 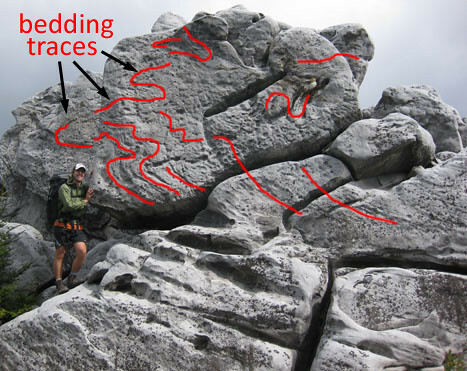 Within the Helena formation, there is a conspicuous layer of diorite with contact metamorphosed rock above and below it – the Purcell Sill. 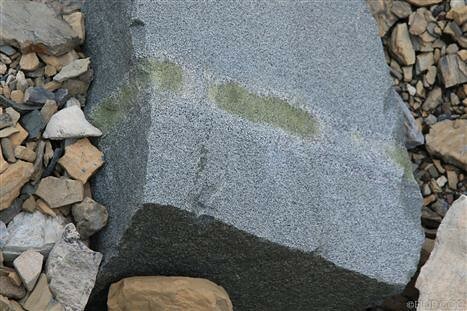 Part of this piece of Purcell Sill diorite has been altered to make the green mineral epidote. 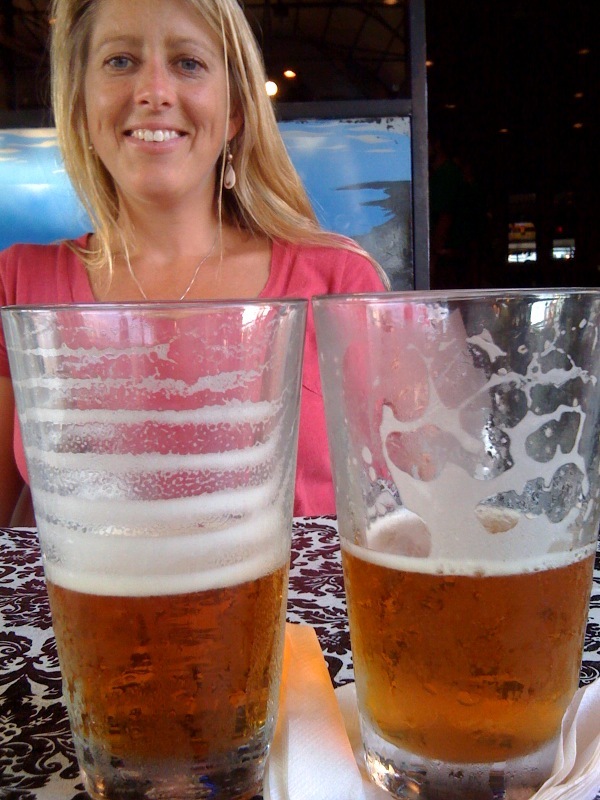 The horizontal field of view is ~80cm. So when one hikes in the area at or above Purcell Sill, all the Grinnell is way down in the stratigraphic column. The red mudstones exposed around the center of the park ( like around Logan Pass) are mostly of Shepard formation. They look a lot like Grinnell, but they are younger. 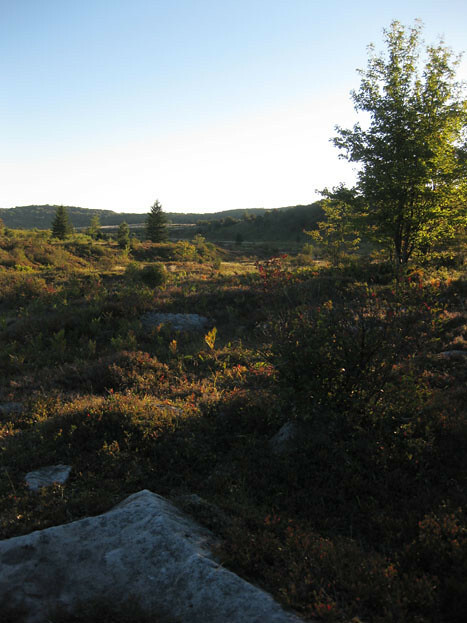 The width of the rock in the foreground is ~ 1m. Mudcracks in Shepard formation near Hidden Lake. The trail to the Hidden Lake has one of the thickest Shepard exposures in the park. There is one more red formation, even younger than the Shepard. This is the Kintla formation. Most visitors don’t encounter the Kintla. It can be seen as a red cap on the tops around Logan Pass (even above Shepard.) There are also exposures around Waterton Lakes on the north side of the Canadian border, and, of course, around Kintla Lakes and Hole-in-the-Wall on the northwest side. 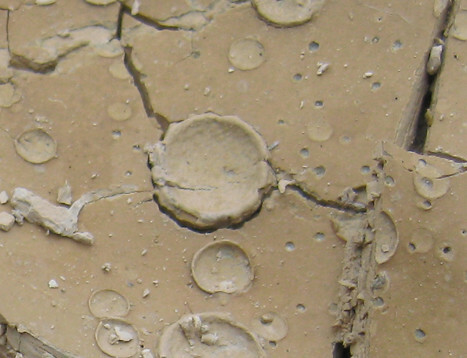 This cross-section of mudcracks at the Boulder Pass are possibly within Kintla formation or Shepard formation. 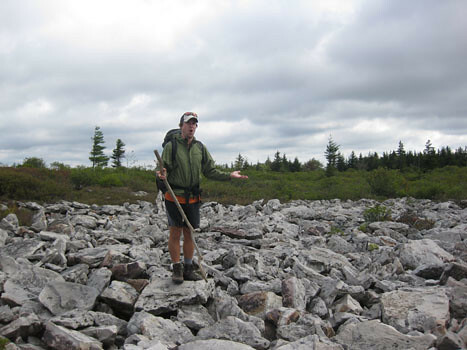 It is really hard to tell without a precise geologic map. At any rate, it is NOT Grinnell. 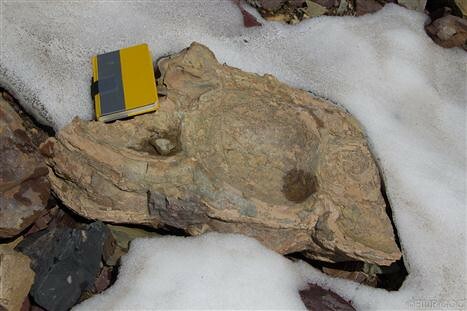 The width of the rock in the foreground is ~ 70cm. 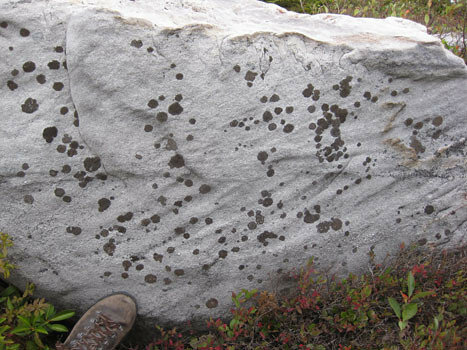 Sometimes there are areas of low oxidation called reduction spots. 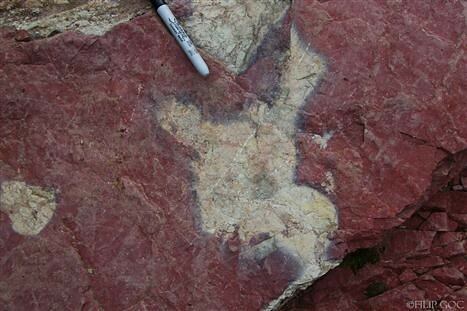 As the red color of Grinnell formation is caused by oxides of iron, non-oxidized Grinnell has a different color: the greenish Appekunny tone or shades of orange. 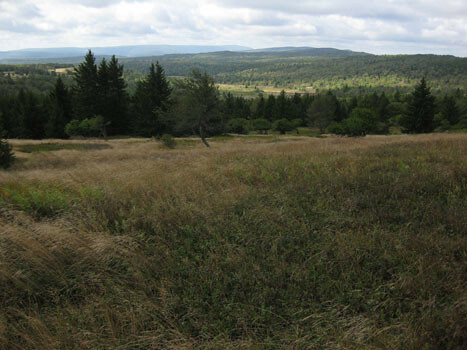 There are whole greenish beds of reduction within Grinnell. 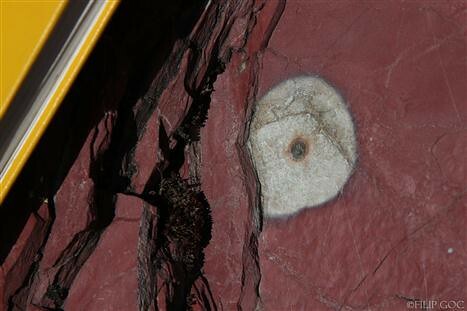 The cool thing is that iron content is roughly the same throughout the rock! GAME for you: What do you see when you look at this reduction zone? 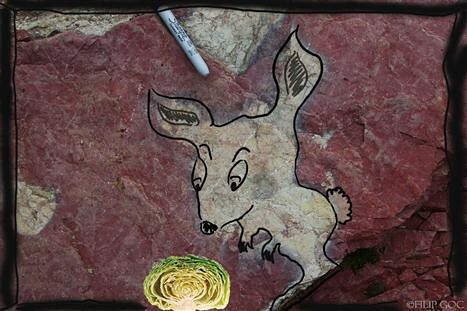 It is a bunny rabbit, and he is looking for stromatolites, or so-called “cabbage heads”! 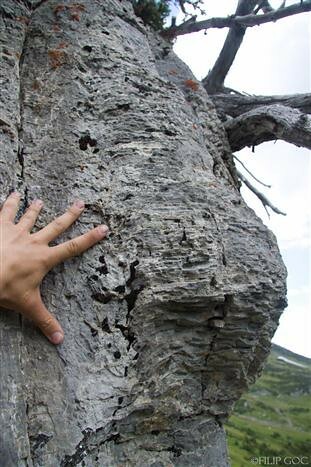 So what is a stromatolite? Did the bunny choose the right formation to dig in? If not, what formation would be better? Stromatolites are blue green algae or cyanobacteria that thrived on Earth in the Precambrian. 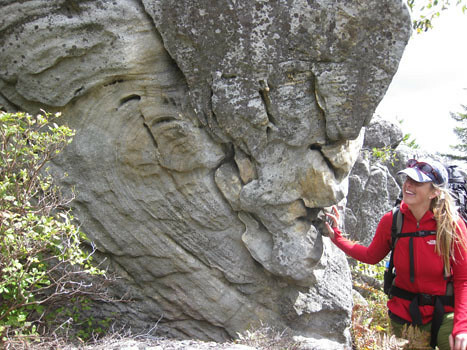 The oldest stromatolite fossils on Earth are around 3.5 Ga. Stromatolites persist in the modern world in places where they are protected from grazing predators like snails. 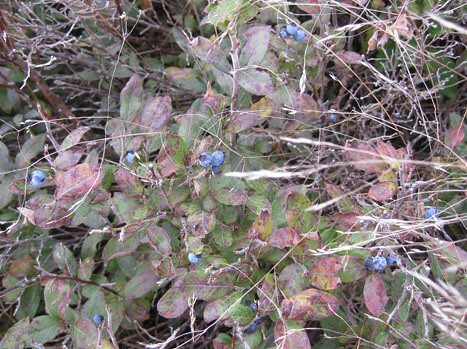 They were one of the first abundant photosynthetic organisms. They essentially remove CO2 from ocean; use the carbon for themselves while causing precipitation of calcium carbonate, and release the oxygen. They cover their cells with protective slime. When the slime gets too covered in sediment, they just grow a new layer, which results in dome-shaped layered “cabbage heads.” Stromatolites used to be so abundant that the sheer volume of oxygen they produced significantly changed the composition of our atmosphere. Stromatolites made our planet suitable for organisms like us! Stromatolite beds are within many of Belt formations. 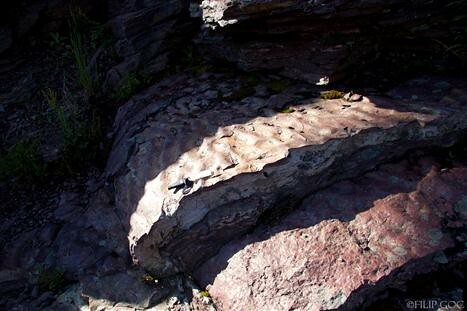 The major stromatoliferous bed in Glacier National Park is the Helena formation. 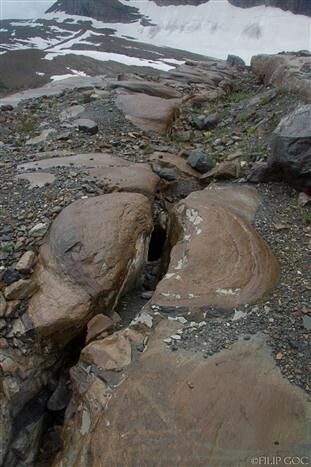 Some beds are in the Altyn and Snowslip formations also host stromatolites. Here is our little group hanging out with the Helena stromatolites. Notice the easily visible glacial striations! This awesome 1.8m diameter stromatolite cracked in half! In fact, this one was quite AGGRESSIVE, and had a DEADLY appetite. Exposed at the Boulder Pass. 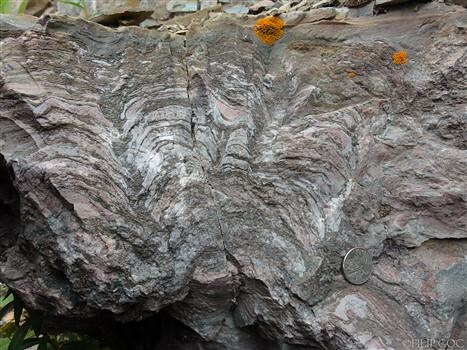 Stromatolite in Shepard formation, as viewed from underneath. 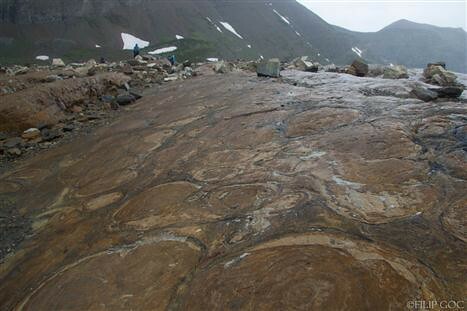 Stromatolites grow dome-shaped, but this is bowl-shaped. Therefore it is upside down. Field notebook for scale. This exposure near Hole-In-The-Wall cirque I named “Stromatolite Wall.” All those columns you see are stromatolites. The wall is some 8m high (exposed). This stromatolite weathered into a three-dimensional column! One can easily see the separate slime layers. 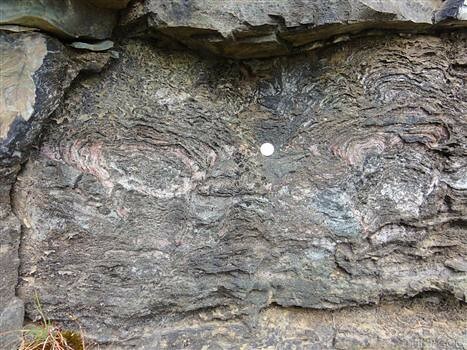 Another absolutely stunning stromatolite bed is in the Snowslip formation. It is not a thick one, but special. 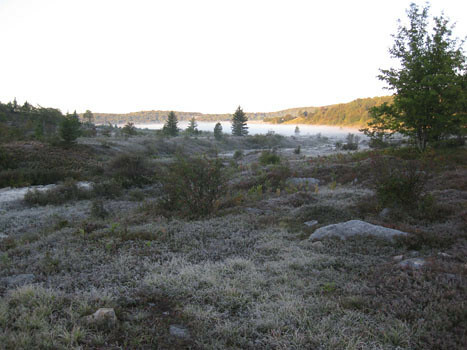 The Snowslip formation was deposited closer to shore than the Helena, and the algae had trouble living there. 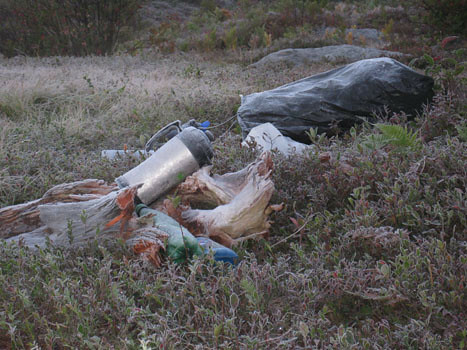 There was quite some amount of organic material and mud periodically dumped in. Stromatolites caught the mud with its load of minerals into the slime layers, and those minerals later stained the fossils. The result: RAINBOW STROMATOLITES (my term). Next time somebody whines about how stromatolites are boring blue green grandpas, sitting around for billions of years doing nothing, just show them these playful buddies. 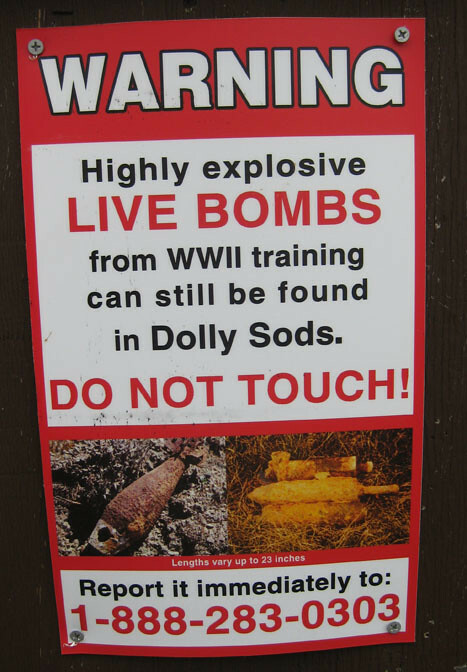 There’s one more interesting feature in the Helena formation. 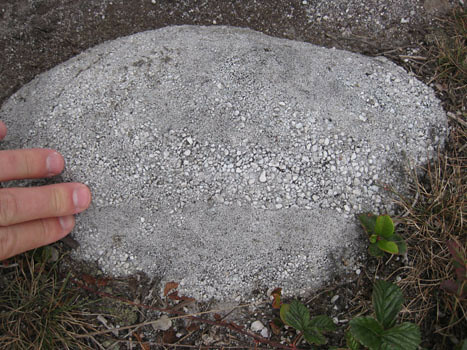 OOLITIC LIMESTONE. I made it uppercase because most people don’t see this in the park. 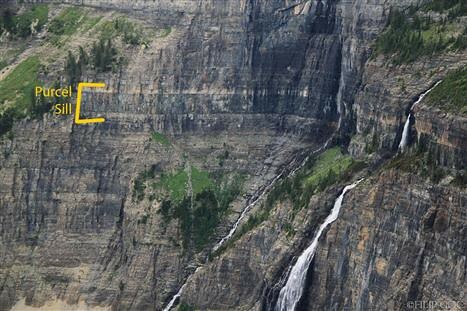 It is exposed just next to the Going-to-the-Sun Road in the western part of the park. 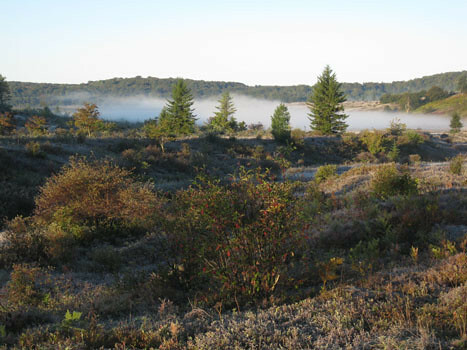 In the photo, the gray beds are limestone, the brown ones are sandstone. If you look closely, you should see the oolites. They are ~0.5mm in diameter. Quarter for scale. 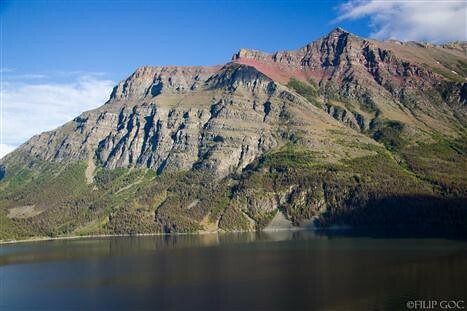 Although Glacier National Park is primarily famous for its jagged glacial landscape (and for a good reason! ), the rocks that make up its horns and arêtes are remarkable as well. 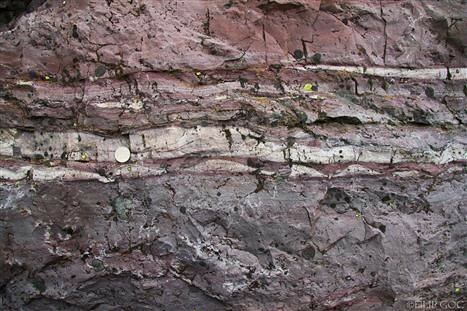 Despite having been displaced ~50miles east, they retained many of their primary sedimentary features. 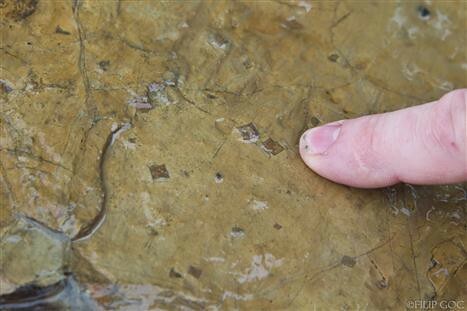 It’s common to spot beautifully preserved ripple marks or mudcracks. The abundance of fossil algae – stromatolites – is striking as well. Glacier National Park offers arguably one of the best Belt rock exposures in the US, which also makes it extraordinarily colorful. The deadly combination of colorful strata, white snow, and jagged peaks ensures the park is the one of the most scenic places around. It is just gorgeous up there. Here’s a new video from Greg Willis, the same guy who brought us a fine video on Piedmont geology. 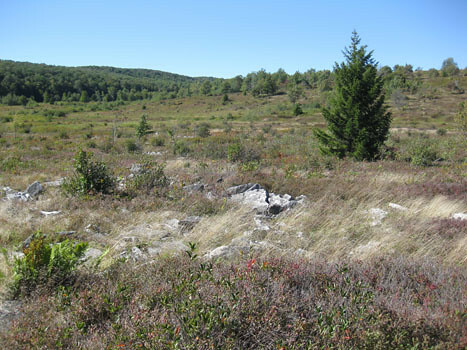 In this new opus (20 minutes), Greg details the geology of the Massanutten Synclinorium (Shenandoah Valley, Massanutten Mountain, and Fort Valley) in western Virginia. WordPress isn’t letting me embed it here, but you should go and check it out! 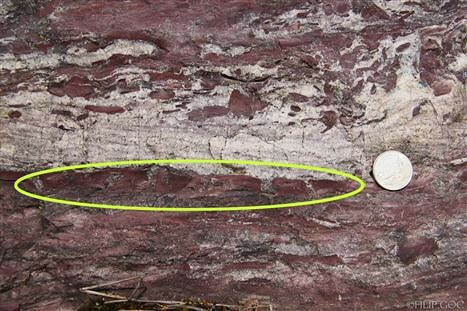 The graded bed starts at the Swiss army knife at left, where you see an abrupt transition between coarse grained metamorphic porphyroblasts (“pseudo-andalusites”) and finer grained quartzite. 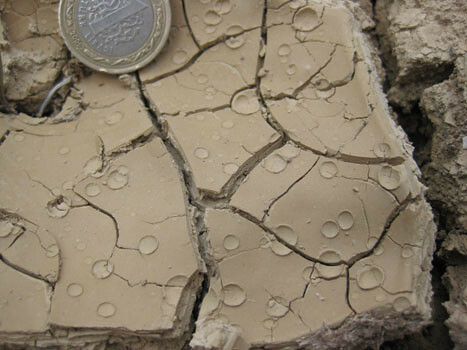 This was once a mud to sand transition when these were loose sediments in the Kronos Sea, but with elevated temperature and pressure, the clay minerals in the mud reacted to grow elegant porphyroblasts of andalusite and sillimanite. The sand was made of quartz: less reactive stuff, and all it did was fuse together when metamorphosed. 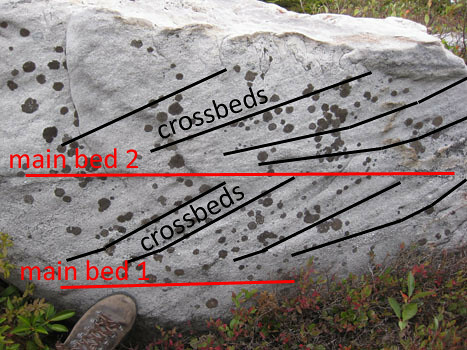 I love this: the coarse to fine relationship in the original graded bed is flipped on it’s head by metamorphism. Follow the bed “up” (to the right), and you will see the quartzite grade into andalusite-dominated former mudstone. Pretty sweet, eh? 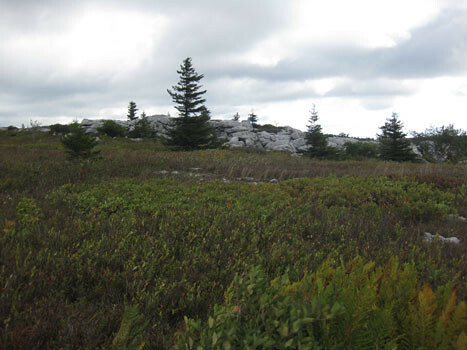 This example is from the summit area of Mount Washington, New Hampshire. More fun stuff when I get back to my home computer next Monday.